CRAIG — Access to public lands affected by fire may reopen soon, officials indicated in a news release Monday, Sept. 17. Fire activity on Boone Draw Fire has greatly diminished through the past several days. Fire crews have made significant progress, achieving approximately 80-percent containment Monday, though hot, dry weather is expected to continue throughout the week. While the fire is holding at 8,683 acres, only 202 acres are within the Sand Wash Basin Wild Horse Herd Management Area. The Sand Wash herd appears not to have been significantly displaced by the fire. Firefighters have observed horses enter the burned area, drink from springs, and exit toward Sevenmile Ridge. The fire burned some fences around the HMA, and temporary fencing has been erected in affected areas. Along with containment, crews are focused on mopping up and repairing fire suppression impacts. Fire officials are beginning to release fire crews, as fire activity declines and work nears completion. Several engines were released Monday, with more crews expected to be released Tuesday and Wednesday. County Roads and BLM lands around the fire remain closed to public entry for firefighter and public safety. BLM and Moffat County officials continue to assess the closure, with a goal of reopening the area as quickly as possible. Visitors looking for horse viewing opportunities can access the HMA by way of Moffat County Road 75, along with the Sevenmile Ridge area north of the fire. The Craig Interagency Dispatch Center reported engaging on 200 wildfires, five false alarms, and 92 smoke checks as of 4 p.m. Tuesday, Sept. 18. On Sunday, the smaller Three Wash fire was reported contained to 369 acres. Three other large fires — Cabin Lake, Silver Creek, and Ryan fires — are also burning in the region. The emergency area closure has been lifted for forest and BLM lands near the Cabin Lake fire. Much of the burned area has cooled, but there is still active fire in the Sterry Lake area. The Sterry Lake Trail Number 2240 and Forest Service Road 240 will remain closed until fire activity there ceases. A map of the Cabin Lake fire as of Sept. 2. The Cabin Lake Fire is 98-percent contained, though it continues to burn in interior fuels. Hunters and others entering recently burned areas should exercise caution and understand that fire can create forest hazards. Fire-weakened trees may fall, and roots of trees can burn underground, creating ash pits that may not be readily visible. Burned forests are especially hazardous in windy conditions. A map of the Silver Lake Fire as of Tuesday, Sept. 18. The Silver Creek fire is now at 12,214 acres, with 35 percent containment. On Monday, evacuated residents of Gore Lakes and Old Park were allowed by the Grand County Sheriff’s Office to return to their homes. Firefighters are working to limit the fire’s impact on local communities. Personnel are actively engaging the fire where it is safe to do so and implementing a full suppression strategy. Crews are working the southeastern edge of the Sarvis Creek Wilderness in the Silver Creek drainage west of Colorado Highway 100. More than 420 firefighters are now working the fire. Resources are limited in the area with the new Ryan Fire near Walden. Currently, the Silver Creek Fire takes priority for air support. On Monday, a combination of increased cloud cover and lighter winds helped minimize growth of the Ryan Fire. Scattered showers fell on portions of the fire Monday afternoon. Map of the Ryan Fire as of Monday, Sept. 17. 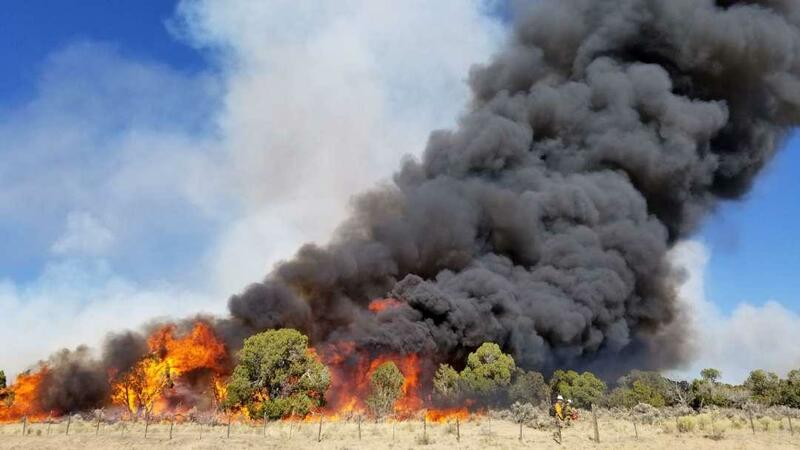 The fire, located 27 miles northwest of Walden, is burning in the Routt National Forest within Jackson County, and the Medicine Bow National Forest within Carbon County, Wyoming. The Ryan Fire is currently at 2,470 acres with no containment. The cause remains under investigation. An area closure is in place for National Forest System lands surrounding the Ryan Fire to ensure the protection of the public and fire personnel and will remain in effect until rescinded. This closure is on portions of both the Routt and Medicine Bow National Forests. The Ryan Fire area closure will primarily affect hunters with licenses in Game Management Unit 161, as well as Elk Area 13 and Deer Area 81 in Wyoming. Hunters are encouraged to obtain a copy of the area closure map before heading into the field. The complete closure order and map are available at inciweb.nwcg.gov/incident/6210/. Contact Jim Patterson at 970-875-1790 or jpatterson@CraigDailyPress.com or Sasha Nelson at 970-875-1794 or snelson@CraigDailyPress.com.